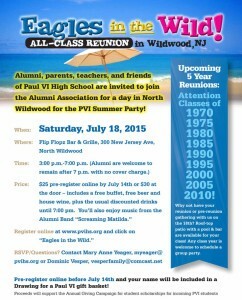 Alumni, parents, teachers and friends of Paul VI High School are invited to join the Alumni Association for a day in North Wildwood for the PVI Summer Party, Eagles in the Wild. Eagles in the Wild All Class Reunion is Saturday, July 18 from 3 p.m. to 7 p.m. at Flip Flopz Bar & Grille, 300 New Jersey Ave, North Wildwood. Register online at www.pvihs.org and click Eagles in the Wild.